WHITE CENTER, WA -- The Highline Bears (0-9, 0-5 PIL) continue their winless start to the season in their return to Mel Olson Stadium. 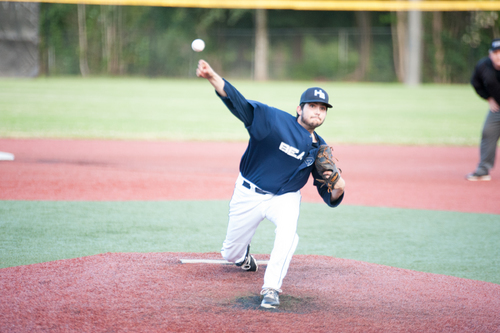 The Bears suffered a 3-0 loss to the North Sound Emeralds Friday night. After missing two home games due to weather cancellations, the Bears were nothing but grateful to be home, but the night ended with another rough outcome. The Bears could only muster five hits in the effort, two of which came off the bat of right fielder Alex Bryner. Bryner was aggressive at the plate and it paid off singling twice in four at-bats. Bryner also provided some highlight defense, leaping against the fence in left-center field and robbing the Emeralds of extra-bases. “I just feel comfortable out there.” Bryner said. There was quality work tonight from the Bears’ pitching staff as well. Starting pitcher AJ Palmer surrendered only three runs in 6 ⅓ innings of work. He allowed nine to reach base and stuck out five in the losing effort. More importantly, the bullpen shut down the Emeralds for the remainder of the evening. Colton Borg entered in the seventh and allowed only one hit and struck out one. Jarrett Hite started the ninth inning off and Mason Harris helped him complete it allowing only one base runner in the ninth. Head coach Josh Evans has confidence that his team has the pieces but they just have not come at the same time. The Bears are now four games into their eleven game stretch that started Tuesday in Walla Walla and ends next Friday against Beyond Baseball. The stretch will continue tomorrow as the Bears host the Redmond Dudes for the first time this season. First pitch at 7:05 p.m.